PRiMA relays are ruggedized and specifically designed to be part of large scale electrical fixed installations, where robustness, reliability and compliance with substation norms are paramount. PRiMA auxiliaries are versatile plug-in relays with up to four pairs of output contacts. The space efficient design allows mounting in any location within a cubicle or panel, whether front or back of panel, DIN rail, etc. Typical applications are for general contact multiplication, interlocking, volts/no volts indication and other annunciation. In the latter case an orange flag (target) is clearly visible in the event of operation. The relays are fast-acting devices. The technology is based on an attracted hinged-armature, whose pedigree within GE stretches to millions of relays in the field. The plug-in nature means that the benign base of the product and the functioning relay unit are in two distinct halves of the ensemble. The former offers easy accommodation and wiring into the fixed electrical scheme, with the relay plugging-in as required. Should an issue ever arise, changing out a relay for a strategic spare is fast and simple. PRiMA has mechanical coding to ensure plug-in to the correct socket, with a secure snap-lock fitting for retention. Wiring options for the base include captive screws, such that wiring cannot result in components getting lost, dropped or misplaced. Time-delayed operation is available, along with selections for self-reset, hand-reset and hand/electrical reset operation. Magnetic blow-out contacts are available for higher interruption duties. 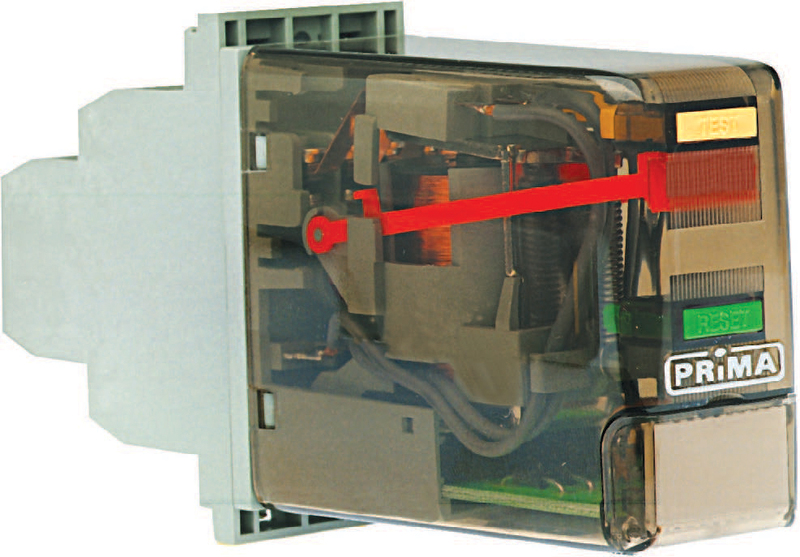 PRiMA offers high performance electromechanical technology in a compact device package.